5/3 Cup of Coffee: Mother Nature continues to spoil the party, as both Portland and Salem were rained out yesterday. 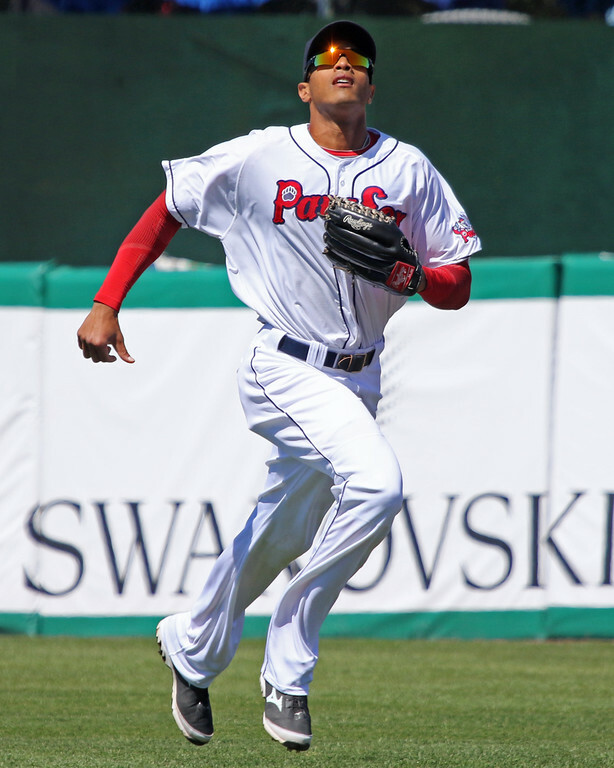 William Cuevas and Justin Maxwell (pictured) led the PawSox to an easy victory over the IronPigs, while the Drive split a doubleheader with Lakewood. William Cuevas had a third consecutive quality start to lead the PawSox past the IronPigs. Cuevas pitched into the eighth, going the first 7 2/3 innings while allowing three runs on six hits, walking three and striking out five, as he improved his record to 3-1. In his last three starts, he is 3-0 with a 2.53 ERA over 21 1/3 innings. Pat Light closed the game out with two strikeouts in the ninth. Justin Maxwell led the offense, going 2 for 4 with a home run. In his first game back from Boston, Marco Hernandez went 2 for 5, and Mike Miller went 2 for 3 with a double and a stolen base. Rusney Castillo went 1 for 3 with a double and a walk, with the double accounting for his first extra-base hit in 12 games. The first game of the four-game series was rained out, and it will be made up on May 13 as part of a doubleheader. Salem was rained out for a second straight day, and the game will be made up today as part of a doubleheader that begins at 5:05 p.m.
A four-run first inning was enough for Greenville to earn a victory in the first game of a doubleheader. Tate Matheny got the scoring started with an RBI double, and he came around to score on a two-run triple by Kyri Washington. Washington then came around to score on a wild pitch. Matheny went 2 for 4 and drove in two runs, and Austin Rei went 2 for 3, but was also caught stealing. Logan Boyd tip-toed around nine hits in four innings to allow only three runs, striking out six without walking a batter. Anyelo Leclerc earned the victory with two scoreless innings of relief, and Bobby Poyner picked up his third save, striking out one without allowing a baserunner. A late comeback bid fell short, as the Drive left the tying run on third base. Down 2-0 to start the seventh inning, Trent Kemp walked with one out and came around to score on Jeremy Rivera's triple. Luis Alejandro Basabe followed with a strikeout, and Chad De La Guerra flew out to end the threat. Basabe did have two of the team's five hits, including a first-inning double. It was a tough loss for Daniel Gonzalez, who allowed only three baserunners in five innings, but two of them came around to score. Austin Glorius followed with a scoreless frame after allowing seven runs over his three previous appearances. Player of the Night: Justin Maxwell going 2 for 4 with a home run stood out on a quiet night. Maxwell has played all three outfield spots for the PawSox this season, but after opening the year with a .263/.423/.317 line over his first 12 games, he hit only .154 over his next eight games. Maxwell played in 100 games for the San Francisco Giants last season, batting .209 with seven home runs, but he is only three years removed from putting up a .252/.328/.436 line over 75 games with the Astros and Royals.